EVANSTON, Ill., December 5, 2018	(Newswire.com) - Katalyst Technologies is pleased to announce a partnership with OutSystems. This partnership enables Katalyst to deliver a fully debugged application, which normally takes a development team many years to produce. This reduces turnaround time and costs for clients. The clients completely own the finished application which is an important consideration. 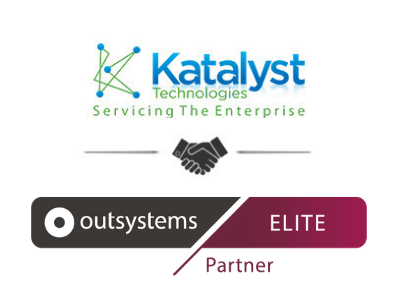 OutSystems was selected by Katalyst because of its unparalleled ability to deliver polished complex web apps and native mobile apps while integrating seamlessly with external apps, services and data in a structured and consistent fashion. Katalyst Technologies is a best-in-class software technology services and solutions provider. Our business and technology experts are highly skilled and work seamlessly across multiple industries, geographies and technologies. Katalyst area of expertise is in ERP, supply chain, engineering, digital and e-commerce, professional services and e-publishing. Katalyst is headquartered in Evanston, Illinois, with additional locations in Atlanta-GA, London-UK, Mumbai Pune, Bangalore, Hyderabad and Chennai (India). To learn more, visit https://katalysttech.com. OutSystems is the number one low-code platform for rapid application development. Engineers with an obsessive attention to detail crafted every aspect of the OutSystems platform to help organizations build enterprise-grade apps and transform their business faster. OutSystems is the only solution that combines the power of low-code development with advanced mobile capabilities, enabling visual development of entire application portfolios that easily integrate with existing systems.